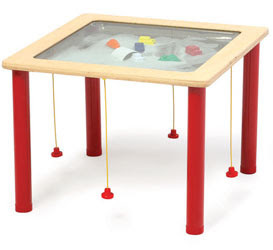 My son loves this table and I knew we could make something similar at home. I set up this invitation using a shadow box frame purchased from Walmart and Poly fil pellets (also from Walmart). We have the magnetic set seen HERE, and used the objects from the set for this project. 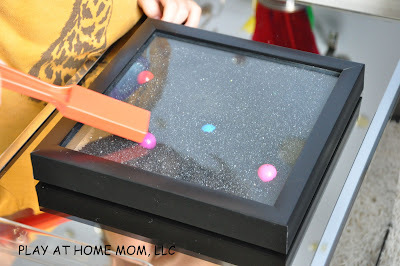 We soon realized that the Poly Fil Pellets were too thick to manipulate the magnets, so we tried some sand (too much sand will make it harder to move the items – and the finer the sand, the better). It was much easier to move the balls around with sand. The magnet wand worked on the underside of the frame as well as on top. This is a great activity for developing coordination. I love that we can change it, add objects, take objects away, etc. There are so many options for play as long as you have items that are magnetic. You can utilize it for color recognition, a fun game of I-spy, or just a calming/soothing activity. It’s still a work in progress for us as I hope to find more objects to add. 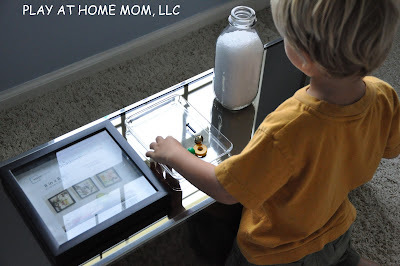 I will add to this post as we continue to explore our new DIY toy. We decided to try sand. Where did you get black sand? This is awesome! That is really cool and unique. I like this idea a lot! Thank you. Thanks for this - that's our rainy afternoon planned! How do you keep the sand from leaking out? I think I got the same shadow box frame from Walmart, but the sand leaks out from both the front and the back. It's not leaking out quickly, but enough that it is too messy to use inside. I have been trying something similar (although I like your frame MUCH better). I found some huge washers in the hardware store that are fun to move around with the magnet. Yeah, how to keep the sand in. Really want to gift this but would like sand to stay in better? Any suggestions?